Bringing you exclusive and just announced concerts each and every time! Alpine Valley Music Theatre is really about to out do itself with a legendary act coming to take it's centre stage! Put your hands together for Dead & Company! 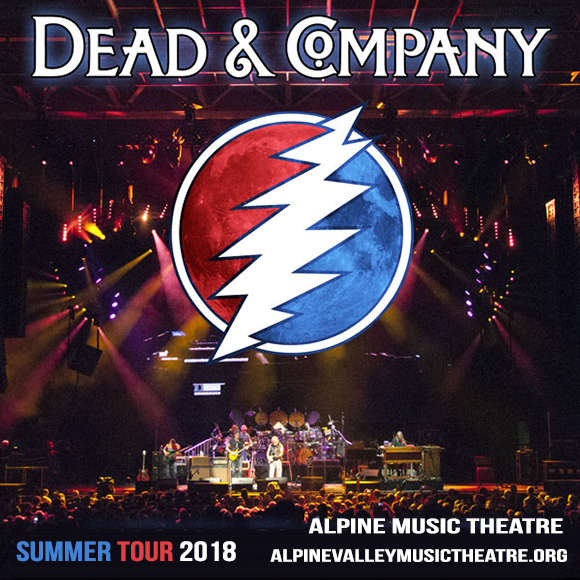 Here's your chance to relive the classic Grateful Dead and be blown away by the sheer talent of a collaboration of some of the best musicians in the world. Friday 22nd June 2018 – you will be entertained! Remember to bag yourself a ticket and book online here as all tickets sold via this site there is free shipping and no service fee! "When all the pieces come together, there really is nothing else on the road today that can compare to a Dead and Company show." "Then, like magic, they and the rest of the band — singer/guitarist Bob Weir, drummers Mickey Hart and Bill Kreutzmann and keyboard player Jeff Chimenti — all achieved sonic lift-off. They blew the sound wide open, and the adoring crowd of thousands was right there with them." There's only a few groups out there that have reached a level of pure appreciation and dedication for music, not just in its straight form but through collaboration and Dead & Company are among them. With a mix of Grateful Dead's back catalogue and also unheard material, every concert is a new and unique experience. With the help of John Mayer and Bob Weir – the band were formed and now continue to make and perform music all around North America and far and wide. This is bound to be another magical show for any fan and even if you haven't heard any of their songs before, this is true musicianship at it's very best and so it's a must-see if you love going to LIVE concerts! Grab your tickets above for the 22nd June 2018!